HOUSTON (AP) — The Houston Texans didn’t pick until the third round in this year’s draft. That hasn’t stopped them from getting plenty of contributions from their unsung rookies, led by Justin Reid, a third-round pick whose 101-yard interception return for a TD helped Houston extend its winning streak to seven games last week. Houston did not have a pick in the first two rounds after trading a first-round pick to Cleveland in 2017 to move up to get quarterback Deshaun Watson at No. 12. They previously sent their second-round pick in the 2018 draft to the Browns as part of the deal to get rid of Brock Osweiler. Because of those moves their first pick this year was at No. 68 and they used it to select Reid, a safety from Stanford. They got center Martinas Rankin and tight end Jordan Akins later in the third round; picked up receiver Keke Coutee in the fourth; and added tight end Jordan Thomas in the sixth. “Those guys have really been an impressive class just from a personal standpoint — maturity, work ethic and they really work hard to improve, and they understand their role on the team, their spot on the team,” coach Bill O’Brien said. Reid has appeared in every game for the Texans, has 53 tackles and leads the team with three interceptions. He might have had a leg up on most rookies because his older brother, Eric, is a six-year NFL veteran who recently returned to the NFL with Carolina. Justin said the two used to sit outside the house and break down film when he was still in college. He knows it’s sometimes difficult for lower draft picks to contribute so quickly, but believes the success of this rookie class has been important to Houston’s turnaround. 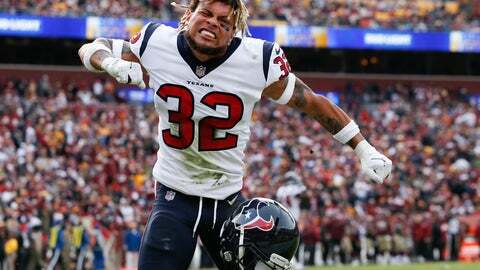 Veteran defensive back Tyrann Mathieu agreed and raved about Houston’s rookie class. Rankin has appeared in each game with three starts, and Akins, Thomas and Coutee have also contributed on offense. Coutee has played a bigger role since Will Fuller suffered a season-ending knee injury, and he has 26 receptions for 273 yards and a touchdown. Akins has 11 receptions for 131 yards. Thomas has 10 receptions for 138 yards and has become a favorite red-zone target of Watson and has three short touchdowns. Coutee said a key to finding success as a rookie is making sure the veterans know they can count on you. Reid credits his success this season to the work he puts in off the field and estimates that he spends 10-12 hours a week at home doing extra work to make sure he’s prepared for the games.